Dr Milton Ende (brother of Dr. Norman Ende) describes a use of umbilical cord blood to try to inhibit the growth of a malignancy in a patient who had been diagnosed with lymphangiosarcoma. A series of transfusions of umbilical cord blood was used to establish a hematopoietic transplant in a patient with acute lymphoblastic leukemia. 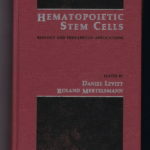 The authors were able to produce an apparently successful bone marrow transplant by using umbilical cord blood. The Virginia Medical Monthly published the original article on use of umbilical cord blood for bone marrow transplantation and raised the possibility of umbilical cord blood banks. This letter addresses this fact. It has been possible to create in irradiated animals a human to mouse xenograft using human umbilical cord blood. Dr. Ende writes a letter to a journal editor (Blood, Vol80, No 6 (September 15), 1992: pp 1623-1631) concerning legal, ethical, and medical questions regarding the harvesting of cord blood. Human Umbilical Cord Blood (HUCB) was injected into mice prior to being subjected to irradiation. After 50 days, 70% of the injected mice were still alive, while 100% of an uninjected control group did not survive. The implications favor protecting humans from the effects of irradiation by means of HUCB.